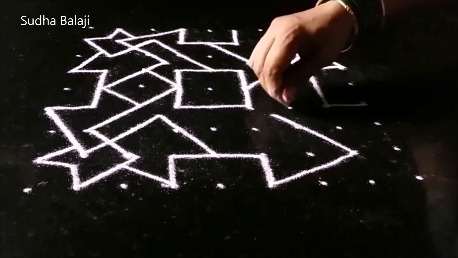 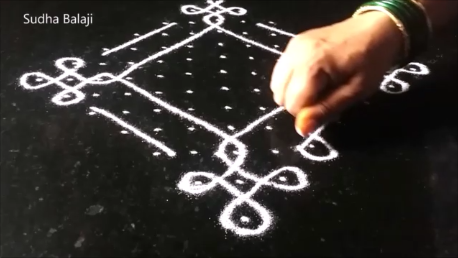 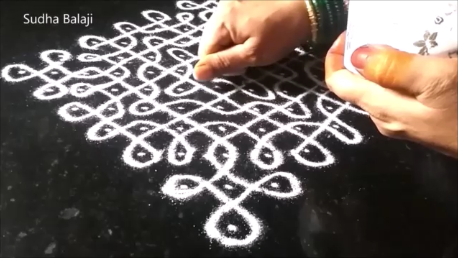 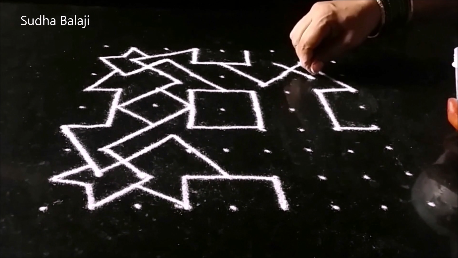 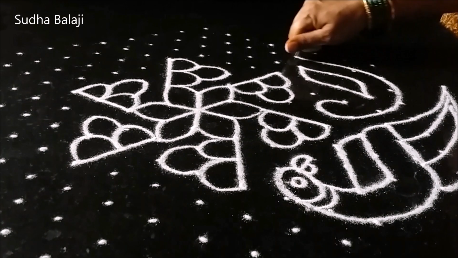 There are many methods to draw these kolam . 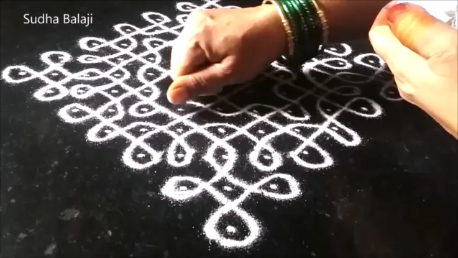 The more the continuous the lines are or in other words the lesser the number of patterns the design is split into to complete the kolam the more beautiful it is. 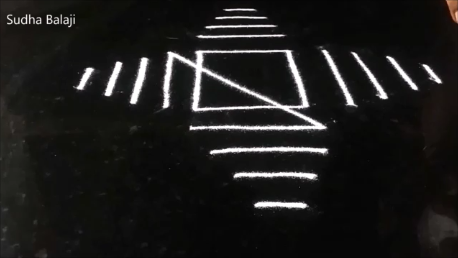 The joints will not be evident. 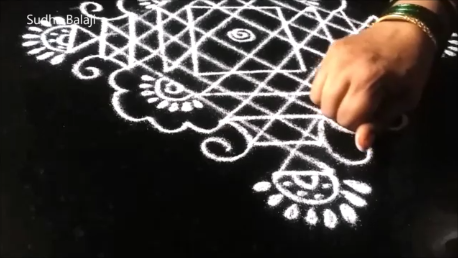 As we near completion of the design, it becomes more and more beautiful. 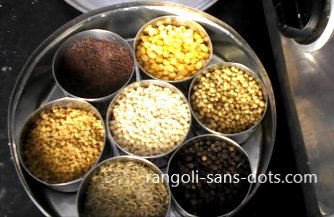 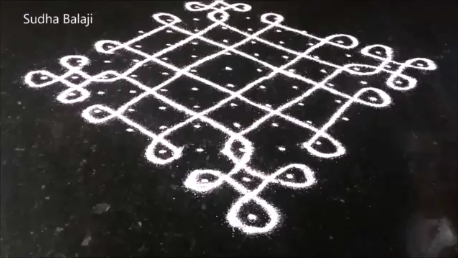 Also called melika muggu , these traditional kolangal are beautiful and unique because the lines go around the dot grid. 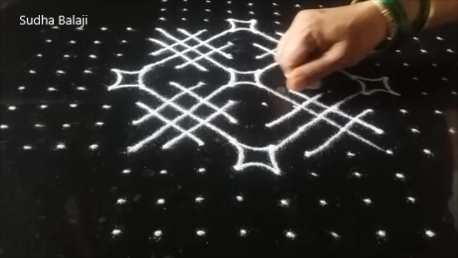 They can be challenging also. 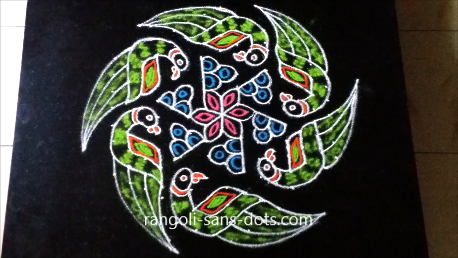 I have added elsewhere a small chikku design that is quite challenging . 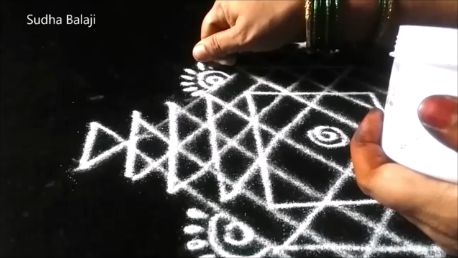 At first it appears difficult and it is difficult to master it too. 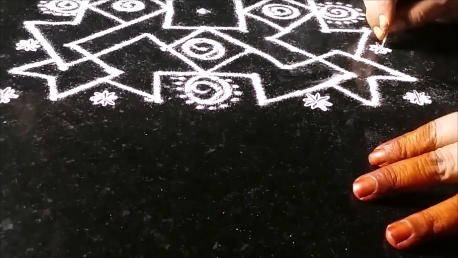 Really hats off to ladies of our country who could do such creative rangoli designs . 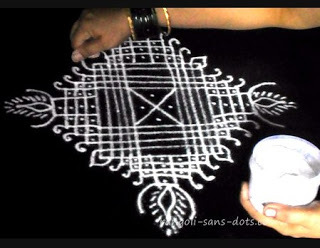 I am not surprised having seen the elder ladies in my family sit with us after dinner creating kolam designs. 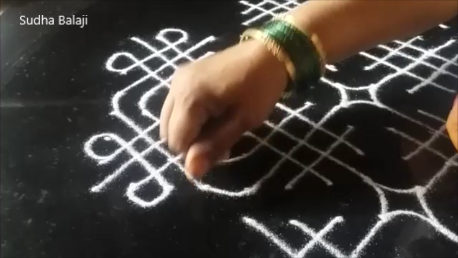 Fortunately there was not distraction in the form of television etc those days so time was utilised in such innovative ways. 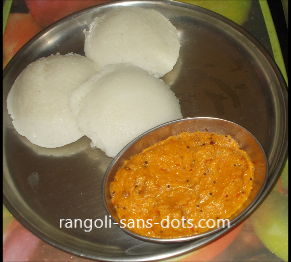 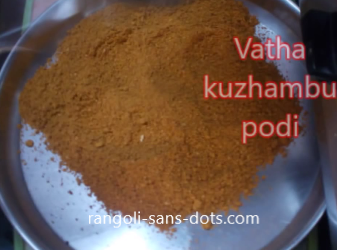 We can add colours for Dhanurmasam or Sankranti otherwise a simple kaavi filling here and there should enhance the attractiveness. 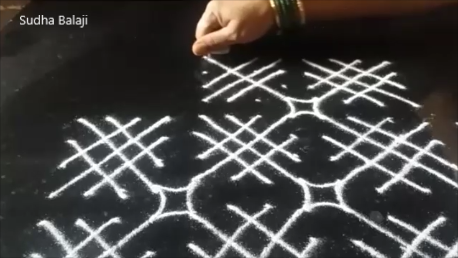 Connect the lines with inclined lines. 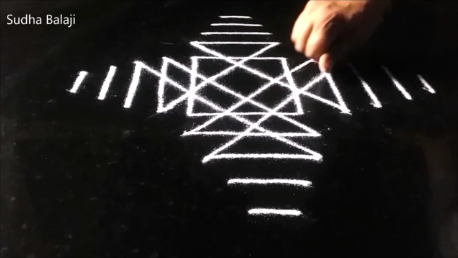 The next few images show the steps. 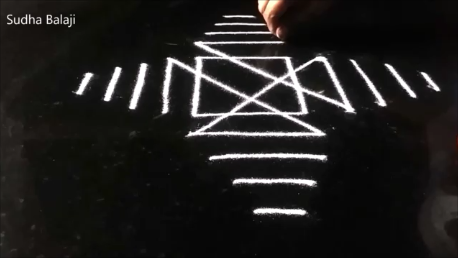 It is not complicated and it follows a rule . 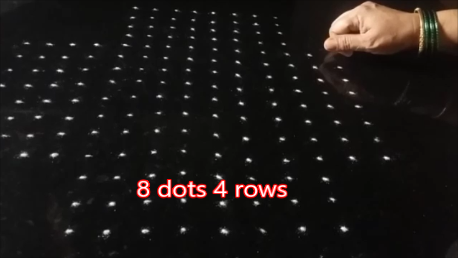 When seen on the image , the bottom right connects to the top left and the bottom left connects to the top right and so on. 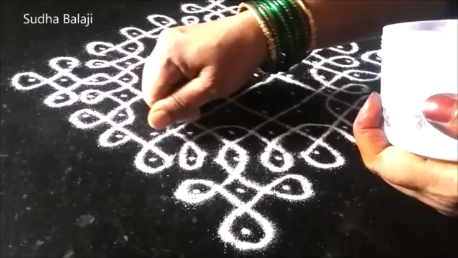 The beauty of traditional kolam is the creativity. 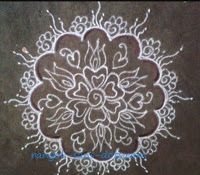 It is amazing and awesome that our mothers and grandmothers could create so many designs ( this rangoli was created by me :) ) . 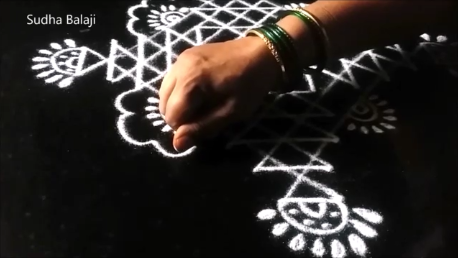 I remember , we sisters discussing with our mother , discussing the various patterns that could be created . 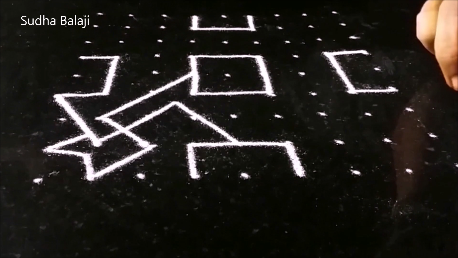 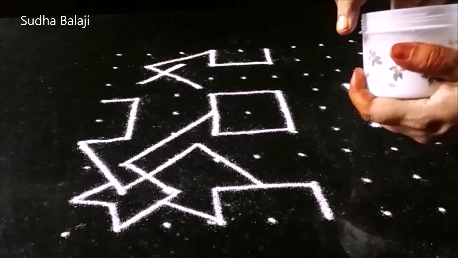 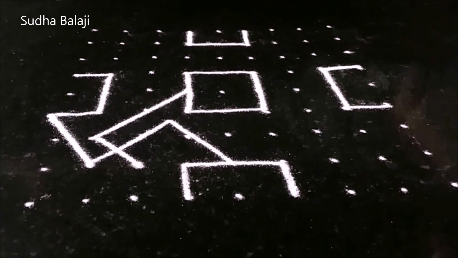 With a chalk piece we used to create on the floor infinite designs . 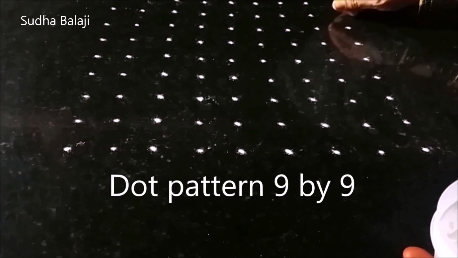 The most beautiful design was usually decided by consensus. 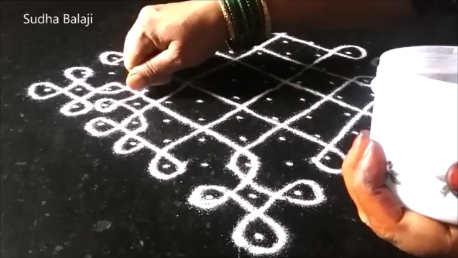 So many positive attributes are given to kolam by modern day scientists like - it improves hand , eye coordination , exercise to the brain and so on. 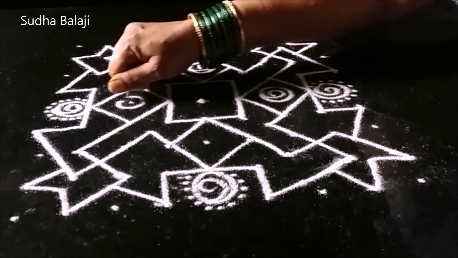 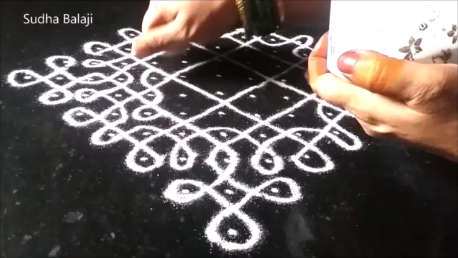 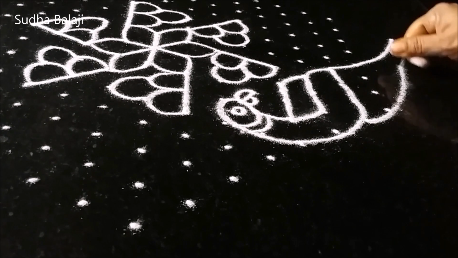 We were blissfully unaware of these benefits of drawing kolam. 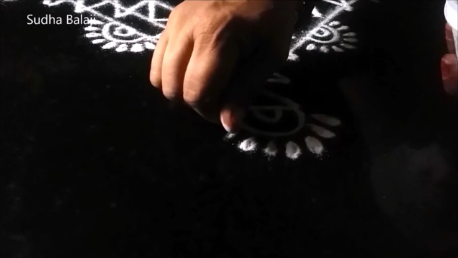 We created , drew with religious fervor because it is a tradition . 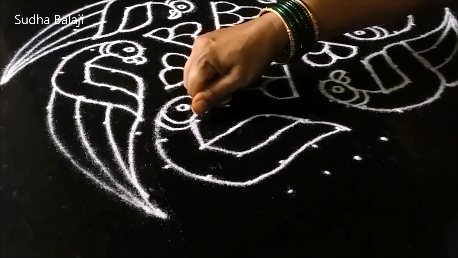 Coming to this kolam , the free hand motifs outside make it more beautiful. 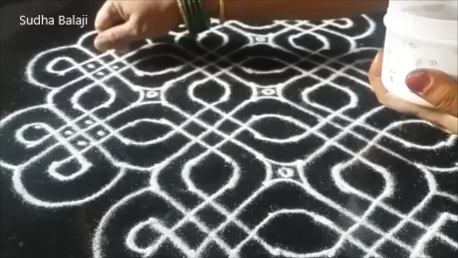 However while selecting such patterns we should ensure that they are congruous with the main design. 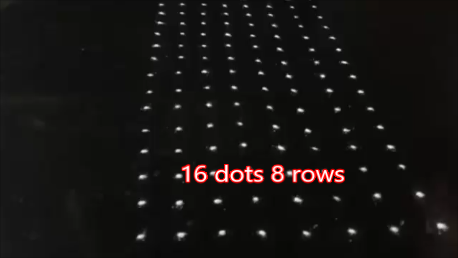 This comes from experience. 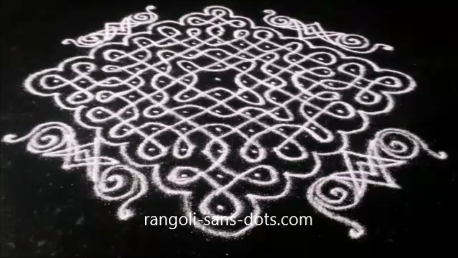 A very beautiful kolam called kili kolam in Tamil. 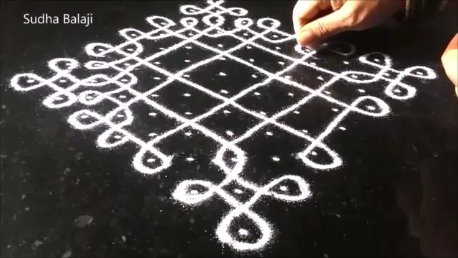 The beauty lies in connecting the dots with curved lines to form the neck and tail. 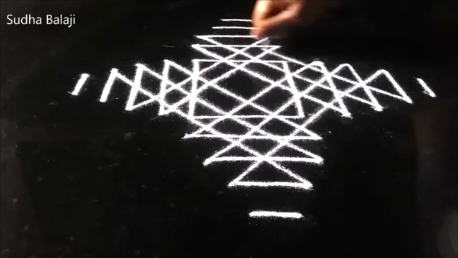 Once we achieve this , it is child's play. 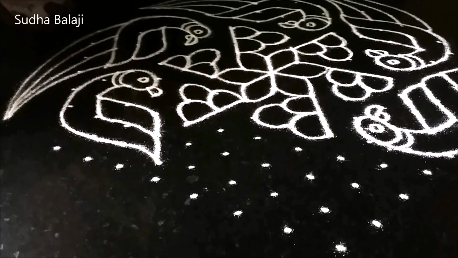 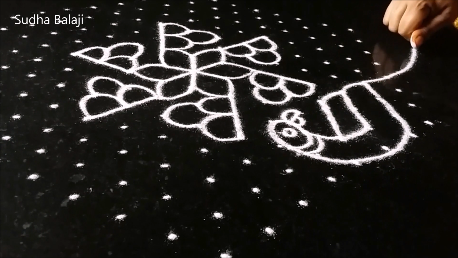 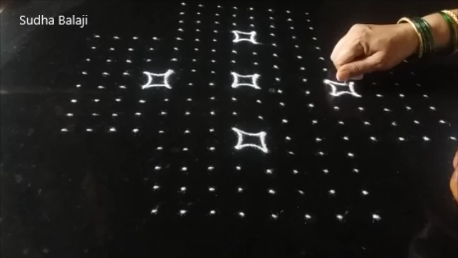 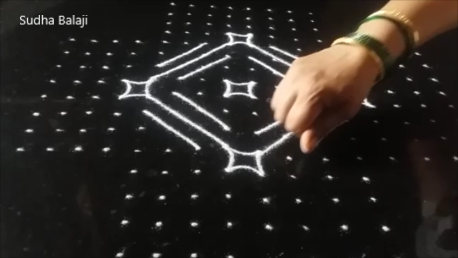 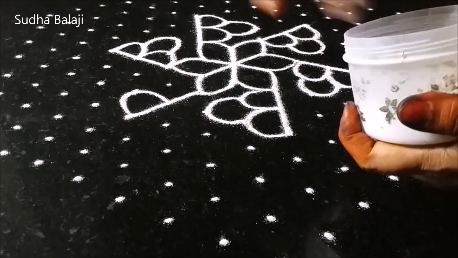 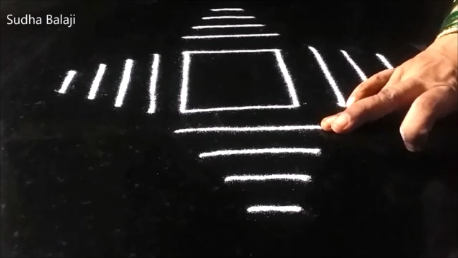 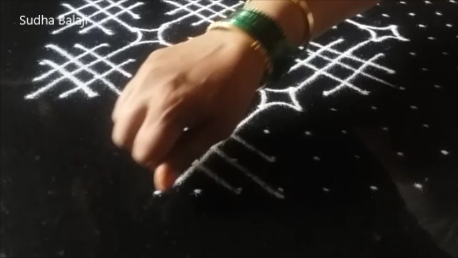 The pictures show the step by step procedure for this awesome rangoli. 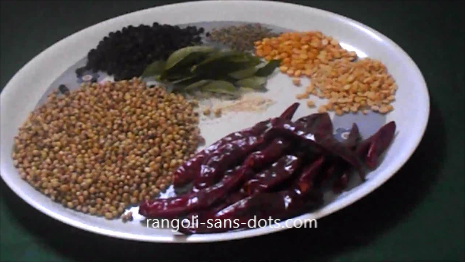 I have added as many pics as possible so that every one can follow easily. 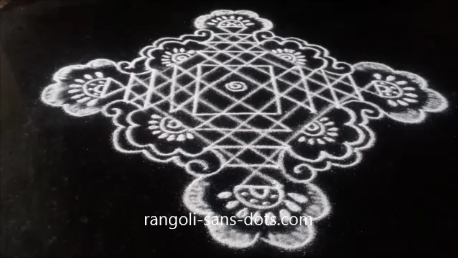 This is a classical rangoli for Sankranthi or Pongal when we try to show off our artistic skills through such designs. 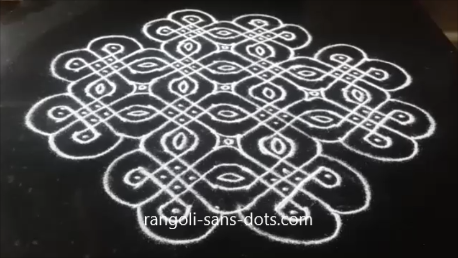 Usually I draw all the kolam standing or sitting from one side only. 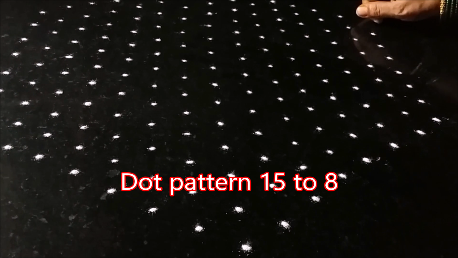 This is not easy because we have to visualise all the patterns , connecting the lines with the dots from one side. 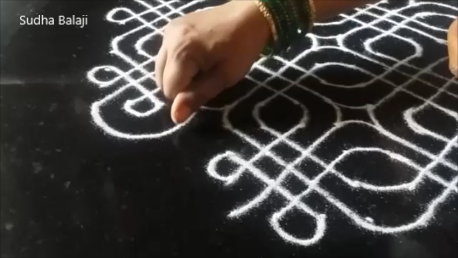 Some how I am comfortable with this technique in most kolams. 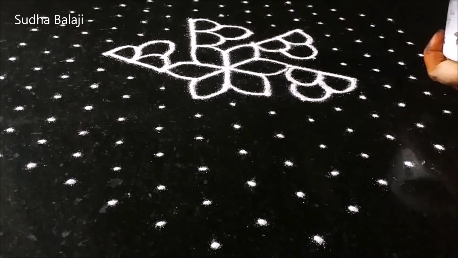 This kolam when I drew for the video to be uploaded on my YouTube Channel it was difficult because I had to get the tails as perfectly as possible on all sides. 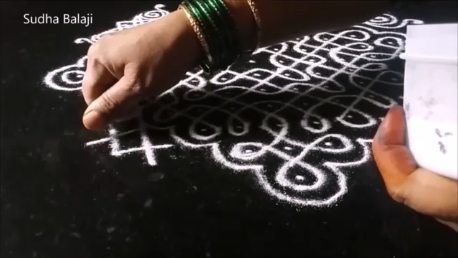 Drawing each kolam is a different experience and gives a new experience too ! 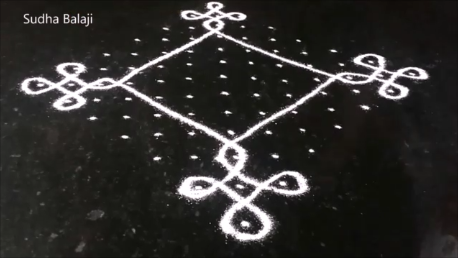 The advantage of this kolam is that it is created with straight line. 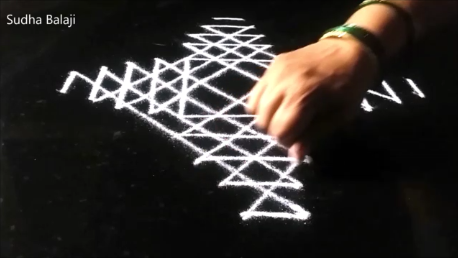 Only when there are curved lines we need more practice and supple wrists. 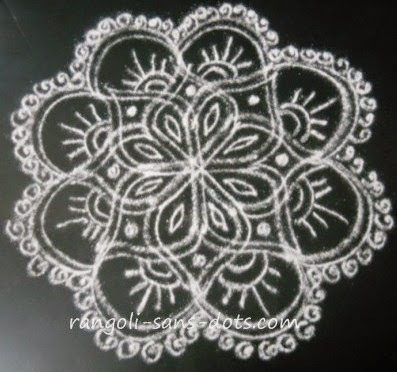 For example flower designs like the lotus. 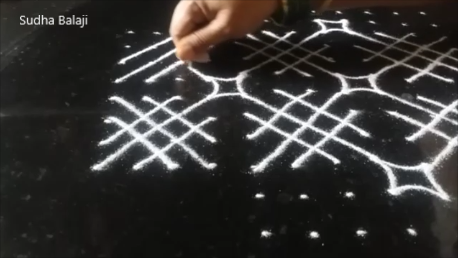 This can be easily drawn by us all. 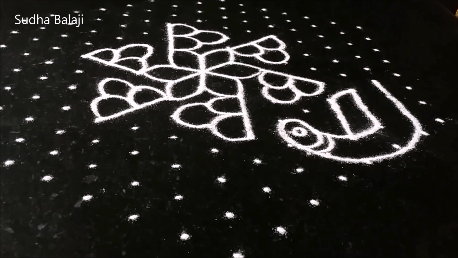 The dots remaining at the edges can be converted into flower designs with a tooth pick or match stick. 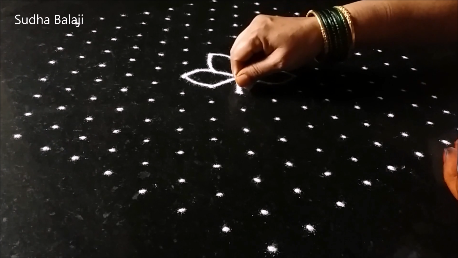 If we want to use a cotton bud we need to have bigger bullets of rangoli powder as the edge of the cotton bud is thicker than a tooth pick. 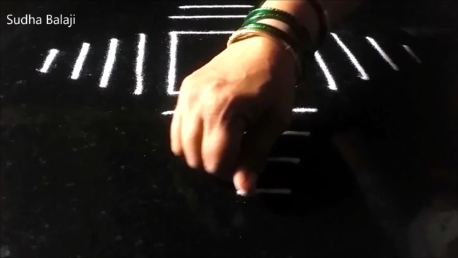 Though we use only straight lines we can get confused , that is why I have added lots of pictures. 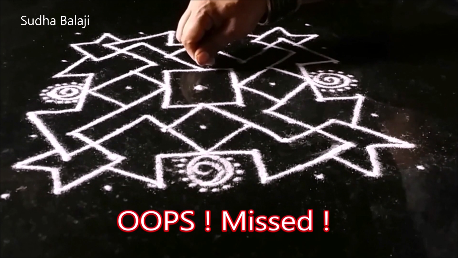 In the photo below we can see that I missed in one of the places , this happens if we lose our concentration even a little bit ! 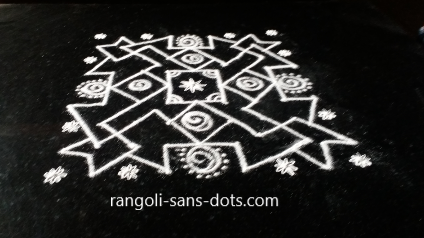 An excellent rangoli for Margali or Pongal particularly to add colours. 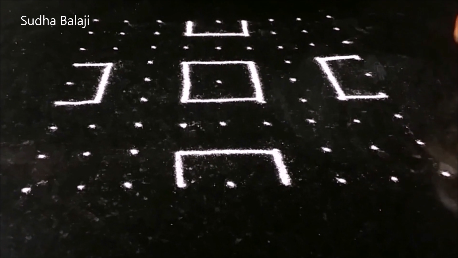 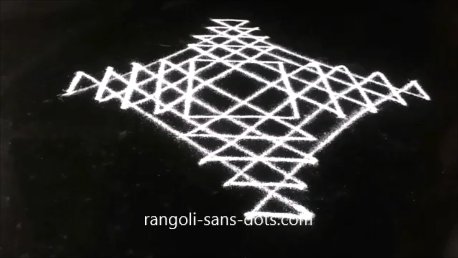 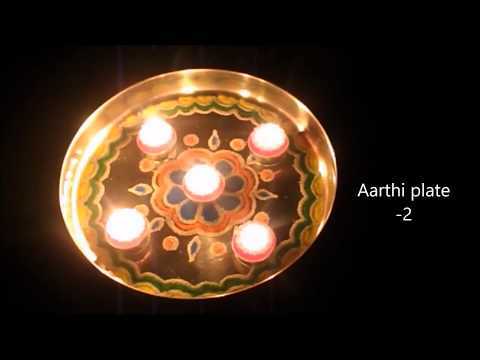 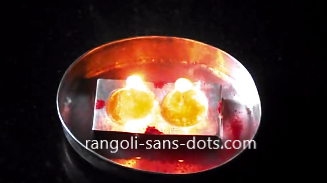 For those who are looking for a square dot rangoli for Diwali this will be simple and suitable.